COLIN KERRIGAN TTN PYT’s menu oozes with juicy burgers and original drink creations. PYT’s burgers were recently featured on Rachael Ray’s “Burger Bash” episode. The Piazza at Schmidts, located on North Second Street and Gemantown Avenue, is home to the area’s latest and greatest bar, lounge and burger joint known as PYT. PYT, which has been open for approximately two years, serves some of the most original and eclectic dishes in Philadelphia until 1 a.m. every night, but is open until 2 a.m.
“The ?uestlove” adult milkshake, for example, was created by the Roots drummer of the same name and features vanilla ice cream, Irish creme liqueur and Frangelico for $10. “The adult milkshakes, a blend of ice cream and various liquors, are really popular among our guests,” Long said. 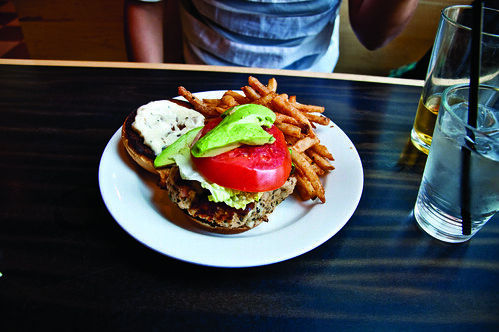 PYT serves a variety of burgers that overflow with meat and toppings. Veggie burgers are available for vegetarian and vegan diners. The restaurant also serves “baby burgers” cooked medium-well at only a fraction of the normal burger-size price. Foursquare, the smartphone application that allows users to “check-in” at various bars and restaurants around the country and view the most frequented establishments, ranks PYT as the second most checked-in restaurant in the world. Anyone of legal drinking age who uses the app and checks-in while at PYT can show the bartender or server their phone and receive a free Kenzinger, Miller High Life or whatever the beer of the week is. Additional discounted drink specials are available all week from 5 p.m. to 7 p.m. for college students looking to save a buck without sacrificing the fun.